With the 2013 NFL draft just nine days away, the Denver Broncos are honing in on some of their top prospects. 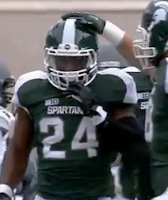 One of those prospects is Michigan State running back Le'Veon Bell, who recently worked out for the team. Bell (6'2", 230 pounds) is not the fastest running back in the draft (he ran a 4.56 at the combine), but his size and versatility make him one of the top prospects. Bell says his football IQ also gives him an edge. After rushing for 3,346 yards and 33 touchdowns and totaling 531 receiving yards during his three years at Michigan State, Bell was compared to Atlanta's Steven Jackson by NFL.com's Bucky Brooks, who says Bell is by far the top RB in the draft. Does he like the comparison? In college, Bell turned heads with his signature hurdle, but he says that is not his favorite move. The Broncos own six selections in the upcoming NFL draft, including 28th overall. With Willis McGahee turning 32 and Knowshon Moreno's future in doubt, Denver can afford to add a RB on draft day. Bell is projected as a perfect fit for the Broncos, as he would give Denver's backfield the much needed power it has been lacking while also adding some finesse to Denver's rushing attack. He would also give quarterback Peyton Manning another weapon coming out of the backfield. The draftniks have already made the connection, and Bell could see himself in orange and blue. Last season, McGahee went down with a knee injury mid-season and was replaced by Moreno, who initially performed well. But in the playoffs, Moreno also went down with an injury, leaving Manning with scatback Ronnie Hillman to carry the load in the backfield. Hillman (5'9", 196 pounds) is liked by Denver's coaching staff, but he is not viewed by anyone as a three-down back. He is a solid relief player and a dangerous receiver out of the backfield, but when he got his opportunity, he was unable to carry the load and take pressure off Manning. Bell is a reliable runner that could spell Peyton when games are on the line. The Broncos are hinting at selecting a RB early in the draft, and Bell has been projected to land everywhere from the first to the fourth round. The most likely scenario seems to be Bell going off the board in the second round, where the Broncos are selecting 58th overall. The legendary John Elway was unable to win a Super Bowl until Terrell Davis joined him in Denver. Manning needs a Davis—Bell could be a perfect fit. The first round of the 2013 NFL draft will be held on Thursday, April 25 at 6 p.m. MT and will be air on NFL Network and ESPN. The final rounds will be held the following Friday and Saturday.